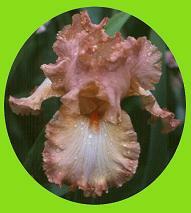 The St. Louis, MO area has provided support to the American Iris Society since the AIS charter year of 1920. There are six iris clubs within 35 miles and two more within 100 miles of St. Louis. In 1929 the spring flower show was held in the downtown Famous Barr Department Store Auditorium. In August 1929 Paul Kohl lectured on "Iris and Iris Diseases." Membership had grown to 1,200 members. The spring Flower Shows were held at the old, now destroyed, MOBOT display greenhouse. Iris were a major part of the show, and constituted an officially sanctioned AIS exhibition. Iris were exhibited by color classification and they were judged as to the best quality cultivar in each color class. Deciding, to which color class a cultivar should belong, was often difficult and controversial. Because of these problems, most iris shows today are varietal shows, and are judged on how well the variety is grown and displayed, not on its quality within a color class. But in 1934, it took judges three hours to judge 47 classes in the iris section. Among the winners were 'Dauntless' (Connell 1929), 'Dolly Madison' (Williamson 1927), 'Dorothy Dietz' (Williamson 1929), 'Los Angeles' (Mohr-Mitchell 1927), 'Sensation' (Cayeux 1925), and 'William Mohr' (Mohr-Mitchell 1925). MOBOT had established an AIS Test Garden in 1925 with over 1,000 varieties of irises planted under the direction of Dr. George F. Moore. This was maintained for several years as AIS sorted and clarified iris nomenclature and varieties. Edgar Shannon Anderson (1897-1969) was a MOBOT geneticist and Engleman Professor of Botany at Washington University. As a botanist and plant explorer he was interested in the evolution of native N. American irises. He registered 'Indomitable' (1939), an I. versicolor X I. virginica cross, and 'Setosa Interior' (1936), an I. setosa species he collected in Alaska. Other St. Louisians of the era who were trying their hand at hybridizing were Josiah Whitnel of Signal Hill and F.W. Keene of Richmond Heights. With the leadership of local future AIS Directors Wellington F. Scott, Jr. and Ada Buxton (both would serve as Region 18 Regional Vice President [RVP] first), GSLIS spun out of the Horticultural Society circa 1950 and volunteered to host the AIS Convention for 1952. "Scotty" chaired the "Meet Me In St. Louis" Convention at the Chase Hotel where the rates were $5.00 single and $7.00 and up, double. Most visitors traveled by car and train. Gasoline was 16.9 cents per gallon and a loaf of bread a nickel. The Registration Fee was $20.00 per person and covered bus transportation for three days, all lunches and two banquets. There were 300 guest irises displayed in twelve gardens including those of Scott and Buxton. 'Bellerive' (C. Benson 47) TB, won the 1952 President's Cup (known then as the Franklin Cook Cup after the fifth president of AIS) for the best iris within the host Region. Benson lived in St. Louis city at that time. Scotty championed Clifford Benson as AIS Executive Secretary (1957-77) and negotiated free office space for the AIS Headquarters at MOBOT where AIS remained for 20 years. Representative iris plantings have been maintained by volunteers continuously since 1957. Through the 1960s several local hybridizers were prominent. This included Joe Becherer of Affton, Harold Schaan, St. Louis, Marvin Olson, Webster Groves, Dorothy Palmer, Manchester, Cliff Elkins, University City, Louise Bellagamba, Bridgeton, and Cliff Benson, St. Louis and Chesterfield. Dr. Kenneth K. Kidd, U. of Wisconsin Ph.D. 1969, did genetic research at MOBOT and grew pure arils in the MOBOT greenhouses. He introduced 'Amethyst Accent' (68) AR, 'Tabriz' (81) AB (OGB), and 'Khyber Pass' (81) AB (OGB) and C. G. White Medal 1994. His genetic research evolved into DNA and Neuropsychiatric Disorders. Today he is Yale University Professor of Genetics, Psychiatry, and Ecology & Evolutionary Biology where he directs the Kidd Laboratory. The Japanese Garden at MOBOT was built in 1977 and is known as SEIWA-EN, a garden of pure, clear harmony and peace. 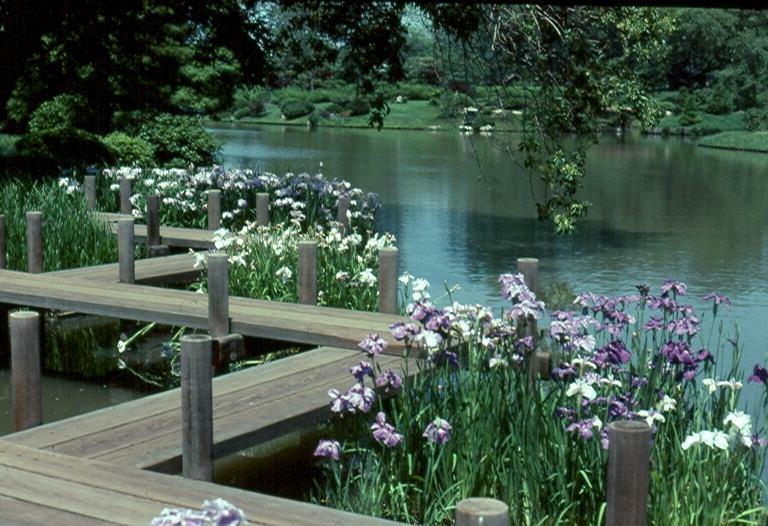 The Japanese irises are planted in the stream bed and by the zig-zag bridge (3), and were donated by Adolph Vogt of Louisville, KY. Two lanterns from the Japanese Imperial Garden of the St. Louis 1904 World's Fair are located here. Both are yukimi doro, or snow-viewing lanterns. The next "Meet Me in St. Louie, Louie" AIS Convention in 1981 was chaired by Jim Morris, who became Region 18 RVP and then an AIS Director. Ninety-seven hybridizers sent 2,000 guest irises which were displayed in seven St. Louis area gardens and six gardens in the Mineral Area, about 75 miles south of St. Louis. An Iris Show was hosted by the Washington (Mo) Iris Club at the St. Louis Marriott Airport Hotel where the rates were $50.00 single and $56.00 double. The Registration Fee was $94.00 per person Early Bird and $105.00 for late registration. Visitors arrived by car and airplane. The President's Cup was won by 'Copper Classic' (Roderick 79) TB. Al Roderick lived in Desloge, MO at that time. That brings us to "The Heartbeat of America," the 2005 AIS Convention chaired by Riley Probst, with over 250 beardless and 3,200 bearded iris guests assigned to eleven guest gardens. The Sheraton Chalet Hotel rates were $100.00 per day and the Registration Fee $199.00 Early Bird and $265.00 for late registration. Youth rates were 50% of the adult rates. Gasoline was well over $2.00 per gallon. Two Iris Shows were held during the AIS Convention. The first was Wednesday, May 11 at the convention hotel and conducted by our sister club the Mid-Illinois Iris Society. The second was sponsored by GSLIS and conducted by Marquette High School Friday, May 13 at Southview School in Crestwood, MO, the first school with a Classroom Iris Project (CIP) to be an AIS Convention Guest Garden. This school had an on-going CIP for handicapped students for ten years. The students were excited about the 2005 AIS Convention visit to their school as were the teachers and the members of the Kirkwood Iris Society (school CIP sponsor) as well as the Greater St. Louis Iris Society. The in-Region President's Cup was won by 'Heartstring Strummer' (Ben Johnson 01) TB. Johnson resides in Springfield, MO. In 1994 the Greater St. Louis Iris Society created a memorial garden for Ann Probst, who was the wife of then RVP Riley Probst and daughter of GSLIS member Phoebe Copley. The garden was built at Mudd's Grove (an1859 historic antebellum home) in Kirkwood, Missouri, only a few blocks from the Probst home. Ann Probst selected and introduced 'Pretty Quirky' (MTB, 92) which went on to win the Williamson-White Medal in 1999. In 1995 GSLIS hosted the International Symposium "Gardening with Iris Species" which was chaired by Robert Pries and which brought together iris experts from around the world. It was held at the Missouri Botanical Garden and limited to 300 registrants. Keynote speakers included Englishman Brian Mathew, book author of The Iris, and a world authority on the genus; Peter Goldblatt of MOBOT, a specialist on the Family Iridaceae; Panayoti Kelaides of the Denver Botanical Gardens and an expert on Alpine and Rock Garden practices; James Waddick, co-author of Iris of China; and Jean Witt, noted iris grower, artist and hybridizer. Additional speakers included Phillip Ogilivie (DC), Eberhard Schuster (Germany), Alan McMurtrie (Canada), Darryl Probst (MA), Colin Rigby (CA), David Niswonger and Robert Pries (MO). During the symposium the Species Iris Group of North America (SIGNA) sponsored a Species Iris Photography Contest which was chaired by Nyla Hughes of Webster Groves, MO. There was also an incredible cut flower display of pure arils and arilbreds brought by hybridizer Luella Danielson from the high desert area of El Paso, Texas. When Ballwin, MO member Jim Morris became the RVP of Region 18 (1998-2000) he chose local member Barbara Lawton as editor of the Region 18 Bulletin. He had collaborated with her by taking many of the photos for her book Magic of Irises. Barbara was a garden columnist (1972-90) for the St. Louis Post-Dispatch and editor (1967-72) for the M.B.G. Bulletin for the Missouri Botanical Garden. An award-winning writer, she is a past president of the Garden Writers Association of America. In 2008 she was named to that organization's Hall of Fame. Our iris society has had a colorful and full history and we look forward to the future. (2) Henry Shaw (1800--1889), a native of Sheffield, England made his fortune in hardware outfitting trappers and settlers entering the Louisiana Purchase Territory via St. Louis. In 1859 he donated his 79-acre country estate for "all time for the public benefit." It is the oldest botanical garden in continuous existence in the United States. Cliff Benson introduced the white TB 'Henry Shaw' in 1959. It won an HM and AM. 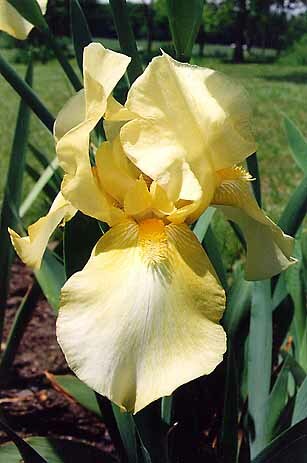 It also won the first Clara B. Rees Cup in 1965 for an "outstanding white iris." (3) Zig-Zag bridges follow a principle of Feng Shui. Negative energy and bad spirits are believed to have problems navigating corners, while people and good energy have no such problem.